Le Quoc Quan was the founder of the Quan and Brothers law firm, which provided legal aid to factory workers and poor people. In 2006-2007, Le Quoc Quan spent five months in Washington, DC, as a fellow of the National Endowment for Democracy, which is funded by the US Congress. He did research on civil society in connection with his interest in an economic development path for Vietnam that would benefit the nation’s poorest. He was first arrested in March 2007, four days after returning to Vietnam, for alleged subversion under the vague provisions of article 79 of Vietnam’s penal code. Following domestic and international outcry, the authorities released him in June 2007, but he remained under constant police surveillance. He was disbarred in 2007 for supposed activities to overthrow the government and his law office was shut. He continued to use his legal skills to comment critically on the persecution of dissidents, such as by publishing a defense brief on behalf of legal scholar Cu Huy Ha Vu before the 2011 trial in which Cu Huy Ha Vu was sentenced to seven years’ imprisonment for “propaganda against the state.” Le Quoc Quan also tried to provide pro-bono legal advice to participants in a politically independent online forum. On August 19, 2012, he was assaulted by two men, one of whom he recognized as a person who had been trailing him for months, and had to be treated in a hospital for his injuries. Le Quoc Quan was arrested again on December 27, nine days after the BBC published his article criticizing the retention of Article 4 of Vietnam’s constitution, which makes the Communist Party preeminent in national political life. The piece, “Constitution or a contract for electricity and water service?” came at a time the authorities were soliciting public input on possible amendment’s to Vietnam’s constitution. Le Quoc Quan’s arrest was justified by trumped up charges of tax evasion, an allegation the Vietnamese authorities have used to prosecute other dissidents. Following domestic and international calls for him to be released, his trial was delayed but, in October 2013, the Hanoi People’s Court sentenced him to 30 months’ imprisonment, which he is serving in Hoa Lo prison in Hanoi. Since February 2, 2014, he has been on a hunger strike to protest his conditions of detention. 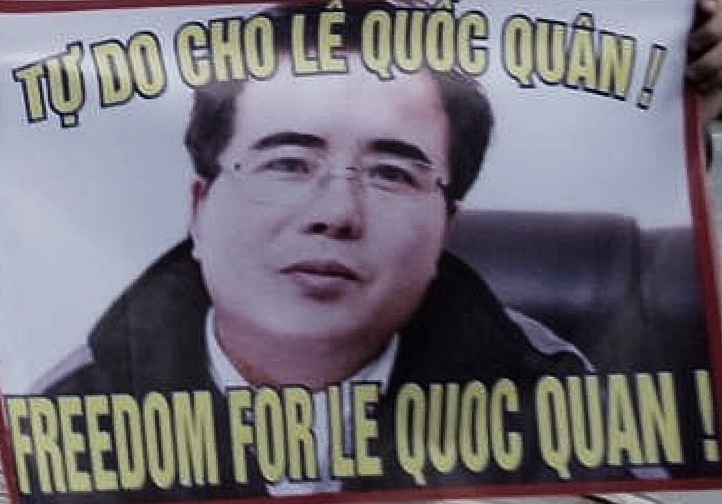 In a decision made public in November 2013, the UN Human Rights Council Working Group on Arbitrary Detention found that Le Quoc Quan had been targeted for his work as an activist and as a blogger and called for his immediate release or for his conviction to be reviewed by an independent court. He applied for appeal immediately after his conviction, but the judiciary was slow to process his request. Finally, on January 22, 2014, the Hanoi Supreme People’s Court gave notice that its appellate division would hear his case on February 18. Update: After a half-day hearing on February 18, the Hanoi Supreme People's Court upheld Le Quoc Quan's conviction and sentencing. "﻿Hiến pháp hay hợp đồng điện nước?﻿"